While rather unsatisfying in its role as a “sequel” to the Silurians, The Sea Devils is really more of a story of the Master and his ability to scheme anyway with the creatures as more of a backdrop. It opens quite well with an alarming scene of a sailor on a violently rocking ship making an SOS call as there are horrible screams in the background. The menace is kept secret for a while until we see the “sea devil” itself, the costume of which has some positives (the tortoise design of the face, the imposing height) and some negatives (the netted clothing, ill fitting headpieces). 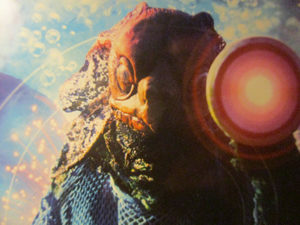 Unlike the Silurians, where it was obvious that they were an advanced race who could be reasoned with, these “sea devils” are not shown to do much more than attack and kill. There thus seems no reason for the Doctor to assume that they have anything to do with the Silurians nor that they are a misunderstood enemy who can be reasoned with—especially since they have downed many ships and killed many sailors. The connection seems to be made just to rehash that successful story line (the Doctor trying to achieve peace while humanity pushes towards war) without having to build those expectations in the dialogue. The Master is the real focus of this story and it’s a neat idea and perfect characterization of the Master to have him seem to be imprisoned only to learn that he’s really running the entire prison from his cell. Surely the Doctor would know that he’d be able to do this and see through the scheme? Then again there are several moments where the Master seems rather naïve as well such as not realizing the Doctor’s accident with the machine was a distraction. Still, the Master comes across quite well in his absolute sway over the prison warden through pure manipulation of character rather than hypnotic mind control. It’s quite sad but fitting to see the poor man thrown aside at the end knowing how his simplicity and loyalty to country was abused. 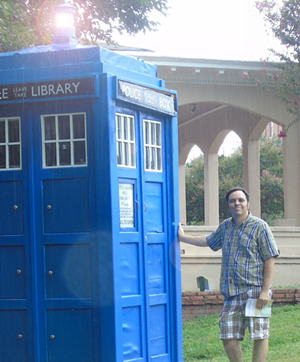 We even get the Doctor mentioning some backstory of them being in “school together”. Unfortunately, it all goes a bit cliché at the end with the Master being surprised at a double cross and escaping by false identity yet again. UNIT is absent in this piece but is of course referred to—most interestingly when the cartoonishly self-absorbed and useless government minister (a staple in many of Hulke’s stories) justifies his intentions to bomb the creatures by citing that the Brigadier had done the same. The Royal Navy was instead put to use to give the story some military flavor, and the BBC crew were obviously quite excited to have the chance to film with them. For that reason, a huge part of each episode involves either close-ups of ships or naval equipment, military personnel, boating and diving scenes, large guns, and military exercises with a hovercraft and jet-skis thrown in to boot. It’s a good use of a sea setting, some beautiful scenery shots, but excitement of the naval scenes wanes quickly and becomes a bit too much. The direction is also quite interesting—lots of above, beneath, and angled shots. Jo Grant comes across as amazingly competent as the Doctor’s assistant all of a sudden. She plays a role as facilitator for him (smoothing the way for his gruff personality), calmly predicts his needs and , and is quite the action hero jumping to his rescue. We even see her actions like bribing the boat captain totally in parallel to the Doctor as though she’s learned from him. It’s kind of fun to see her in this very capable light. Also well acted is the part of Captain Hart—he’s by the book but not stiff (like his sarcasm to his watchman on the phone) and has a realistic reaction to the Doctor, confusion and disbelief and slowly accepting. Even when at odds with our heroes, he still comes across as a capable and sympathetic character. The claustrophobic scenes on the boats could easily have been the most unsettling aspect of the story if they had emphasized the dread in the cramped quarters as the Sea Devils board, especially if they had spent more time on the plight of the men in the slowly sinking submarine. As it stands, I find the scenes of the Sea Devil’s being mowed down by the guns rather affecting. The show itself does some retrofitting, a very early example of responding to some fan complaints, by pointing out that the term Silurian should not have been applied to the creatures as this would have been the wrong era for such creatures. Given that they are entirely fictional, however, I would say we just need to assume the name could apply saying that this was the era when they could have arisen, evolving beyond the level of other creatures in that era and lasting until at least the emergence of primate-like creatures since they know of “apes”. A bit of a more expanded story for the Sea Devils would have been nice—this could have easily been fit in had their been less of the navy ship footage.